With getting this blog up and running, I decided I needed to be truly committed to this ‘job’ and start traveling more; that means booking more trips outside of Berlin. And as I am currently on a budget, inexpensive trips are the only way to go. To find the best deals to anywhere, I typically jump between a few sites before clicking the ‘book’ button. Often these sites show deals to places I would never imagine going (ex. Szczecin, Poland or Brindisi, Italy), but this only adds to the excitement, as I know I am going somewhere a bit off the beaten track. For everyone, these sites can be used as a means for you to book spontaneous travel; whether you want to surprise your partner for a weekend away, find your first destination on a ‘career gap’, or just go somewhere that you have never been before for a period of time. After reading these resources, I double dare you to take that first step and book something. No matter where you end up, even if it is just for a day, you are going to permanently imprint this memory and empowerment of spontaneous travel in your mind forever; and it may even spawn more frequent trips. This site is truly incredible and should really remain a secret (but I can’t help but blurt it out whenever I am with someone). It uses an algorithm to pull out the latest error airfares or super-cheap deals and aggregate them all together. Typically these are odd routes from and to odd airports, but major cities all over the world are in there as well. You can sign up for a daily newsletter by region, so that you can have all the deals sent to your mailbox in one go. My favorite part is that it gives me cheap as hell airfares for just a few locations, so I have constraints and don’t have to get overwhelmed about my breadth of travel locations. I recently booked a roundtrip flight on it from Berlin to Brindisi, Italy for, get this, 19 Euro. I wouldn’t have learned about what Brindisi was, had it not been for Secretflying! I also just booked a flight from Berlin to Los Angeles to see my sister for just 252 Euro. As I am truly an anxious flyer, sometimes I like to stay close to the ground for a trip, and fortunately in Europe, I am only a few hours away to a completely different culture (even by bus). You can download the Flixbus app and start searching different routes from your city (it covers Europe and parts of North America). The best part is, you can cancel or change your booking up to 15 minutes before your bus-ride (you will received credit for a new trip). And while this cancellation feature doesn’t necessarily encourage spontaneous travel, it allows flexibility in letting you change your destination last minute ;). I also love that I can purchase carbon credits to offset the environmental effects from my ride. I recently took a trip on Flixbus to Szczecin for just 20 Euros roundtrip and a trip to Rostock for just 10! 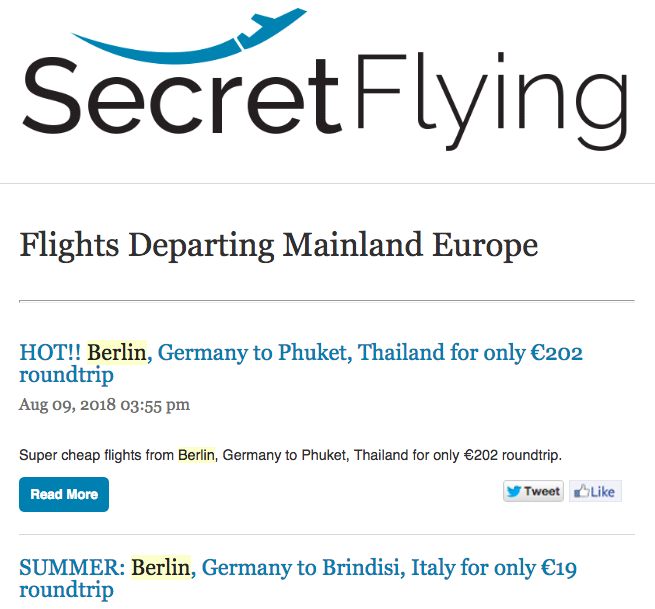 This one is a bit like Secret Flying, but searches entirely for flight mistakes or errors instead of deals. It is free to use, but if you want more specific search options, you can pay just $29. Okay, this one is a little more well-known, but if you haven’t done it yet, put in ‘Everywhere’ as your destination and see what comes up. If anything, it will start bringing up feelings of wanderlust and could even encourage you to grab your credit card and book your next getaway. Skyscanner is a major flight fare aggregator, but its ‘Explore’ feature lets you see destinations and dates when fares are cheapest (for the spontaneous types). A few years back, I studied Skyscanner for hours and was able to book flights from Shanghai (where I was living at the time) to London that included travel time in Urumqi, China, Kazakhstan, Kyrgyzstan, and Istanbul, Turkey for a combined much cheaper than a direct flight to the UK. If you can spare the time, use this tool to find the coolest route to your destination. So I haven’t tried these, but I have heard of friends taking advantage of this! You simply fill out a form listing your preferences and budget, send in a deposit, and the agency will design an entire experience for you…and best yet, you won’t know your destination until you get to the airport. If this isn’t spontaneous, I don’t know what is! While I cannot imagine this is the most budget-friendly way to travel, it is definitely a thrill. I have heard good things about these agencies: Pack Up + Go (USA based), srprs.me (UK), and Lucky Trip (UK). This small list is by no means exhaustive, but I hope it help encourages your spontaneous voyage somewhere. Post below and let us know how you choose to spontaneously travel!